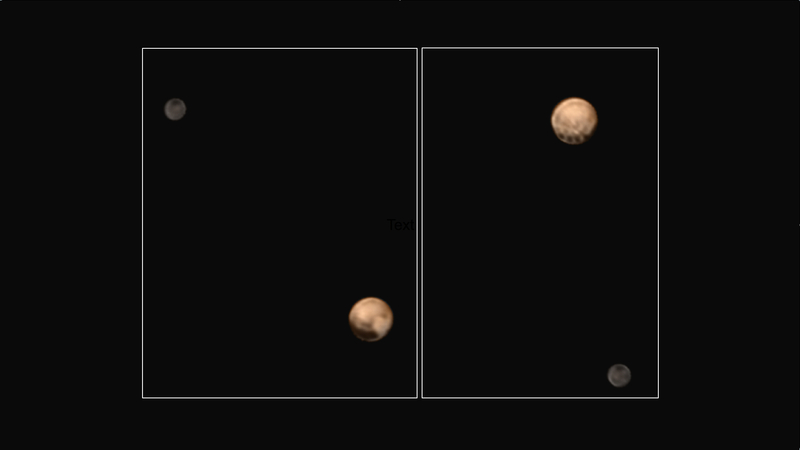 We're closing in - and the dark spots on Pluto are just too evenly distributed? We’re closing in – and the dark spots on Pluto are just too evenly distributed? Astronomically Pluto is a dwarf planet, and since back in 2006 it’s no longer officially a planet in our solar system. But Pluto is still highly interesting, and as NASA’s spacecraft New Horizons‘ closing in, one of the mysteries to be revealed is – what are those strange dark spots on Pluto, each the size of the state of Missouri (about 480 kilometers, or 300 miles in diameter), and how come they are so evenly spaced? LORRI, Long-Range Reconnaissance Imager, has produced black-and-white high resolution images, and when combined with color data in lower resolution from the Ralph camera, it’s possible to see basically what the spacecraft itself is approaching – the natural colors of Pluto and Charon. 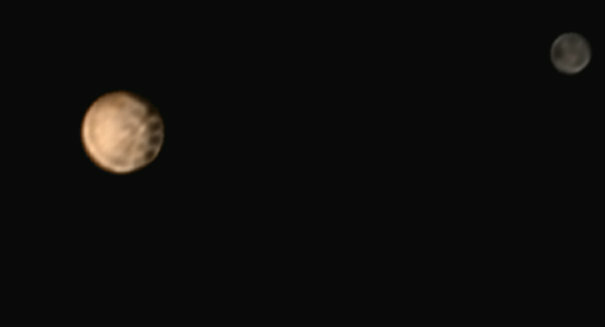 The image shows Pluto to the left, with the mysterious dark spots lined up along the equator. 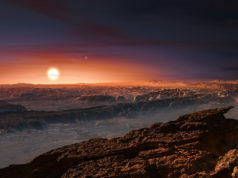 They are also on the other side of the dwarf planet, still unexplained and keeping the world of astronomers on their toes to get a closer look as soon as can be done to find the explanation. Other jobs awaiting the spacecraft as it approaches its destination are also to collect data about the atmosphere on Pluto – scientists have waited for 20 years to reach Pluto, theorizing that the atmosphere was about to freeze and no longer would be available for exploration. So far nothing has happened, the atmosphere is still there and shows no signs of disappearing, which gives the researchers even the more reason to follow these last 9,5 million miles (15 million kilometers) of New Horizons journey towards Pluto and its moon. In the midst of July, July 14 to be precise, the spacecraft will be at its closest, but as it approaches there will still be huge amounts of fascinating, brand new and never before seen data transmitted back to Earth along the way.